Last night, I attended an awards dinner hosted by the School of Engineering and Computing at Glasgow Caledonian University. 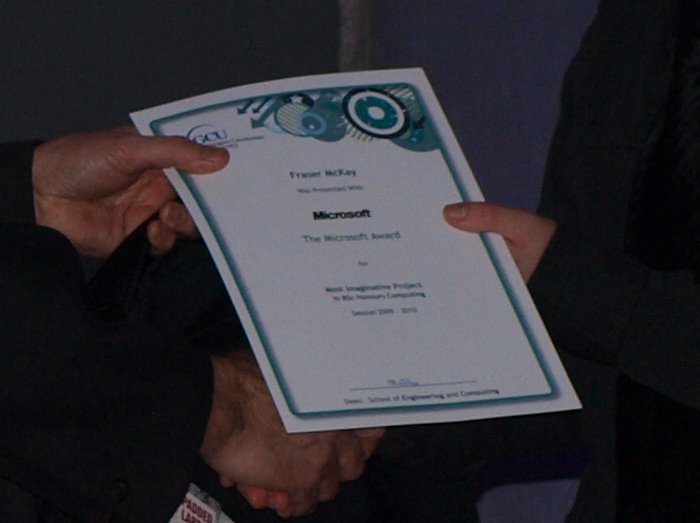 I was delighted to receive The Microsoft Award for the Most Imaginative Computing Honours Project 2009-2010, recognising the innovative original work put into JAKE. Microsoft generously provided a quite substantial prize of software and other merchandise on the night, in connection with Microsoft Student Partners and Dreamspark. The poster showcasing JAKE (seen right) was on display during the reception.